More than anything in today’s world war means imperialism, killing, bloodshed, destruction and murder for oil. 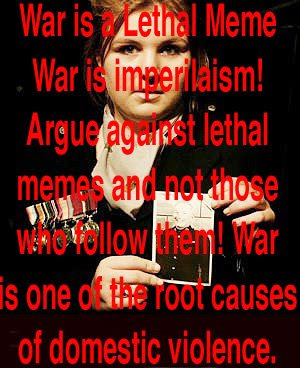 War is a lethal meme and is the root cause of domestic violence in our community. It remains a contradiction in terms to continue to glorify murderers’ and killers’ sent abroad and to jail murderers’ and killers’ in Australia for domestic crimes here. Those who raped, pillaged, plundered and buried their dead for imperialism, queen and country should not be glorified in any way shape or form. Remember them as being stupid, scared or dead yes but glorify them no. The quicker we reform the military into a Humanitarian Aid Group - who can also defend Australia the better - and the more likely that internal crime and domestic violence will be impeded - based on the very notion of leading a county by the example that; violence does not win. 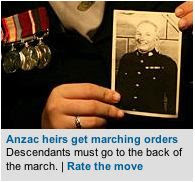 Most of the corporate media and the Australian government in the lead up to this Anzac day have done there nationalist-corporate darn best - not to just remember them but to also glorify war and to exploit the children of war veterans. Shame on them. The news of the death of an Australian soldier in Afghanistan has underlined the dire security situation in the country and brought fears that it will not be the last Australian casualty. Twenty-seven-year-old Special Operations Task Group (SOTG) member Lance Corporal Jason Marks was killed yesterday morning during an attack on a "substantial number" of Taliban militants about 25 kilometres south of the Australian base at Tarin Kowt. 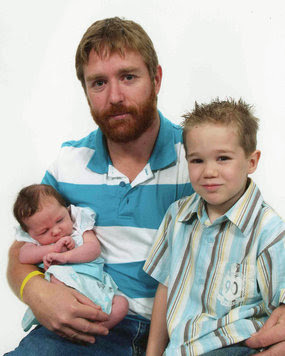 Lance Corporal Marks was a married father-of-two, his wife Casandra said his family was devastated. The death takes the Australian death toll in Afghanistan since 2001 to five, and has again put the focus on Australia's military strategy. Politicians, defence officials and experts on the region all agree the Australian death toll is likely to rise as the illegal and degrading war becomes bloodier - particularly in southern Afghanistan. "News that's not known, or not known enough."